Amanda Palmer announced on her blog yesterday (March 18) that she is putting together a free event tonight (March 19) at the Vogue Theatre. The musician hasn’t formally announced who the guests will be, but she has left several hints. Writing at AmandaPalmer.net, she says “neil [as in Gaiman, her husband and acclaimed fantasy author], jason webley [musician], imogen heap [musician], and many others are in town for TED and of course… ninja must be ninja’d. To that end, Palmer contacted the Vogue Theatre (918 Granville Street), which offered up use of the venue for tonight. She has promised to corral a number of people in town for the conference for tonight’s FREE (she’s asking for a donation of $10-20 to go to the local food bank. According to a Twitter update at @amandapalmer, there will also be belly dancers. The Vogue holds about 1100 people, and tonight’s special event has a first-come-first-seated policy. 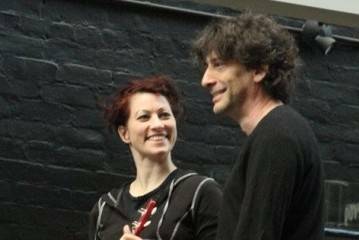 This entry was posted in events, Homepage Features and tagged Amanda Palmer, Geoff Berner, Neil Gaiman, TED, Vancouver, Vogue Theatre. Bookmark the permalink.